Too hot, too cold, smells like "old person"
Writer for The Onion, John McNamee began writing and drawing Pie Comics as a college comic strip in the mid '00s. A shoulder injury meant that he had to simplify his drawing style and improvise his comics, resulting in the quirky, absurdist comic strip Pie Comics has become. There are comics about fairytales, gods, monsters from under the bed, ghosts, superheroes and much more, but as whimsical as that sounds, it is not a comic for children. The drawings are simple but the humour is quirky and a little dark. 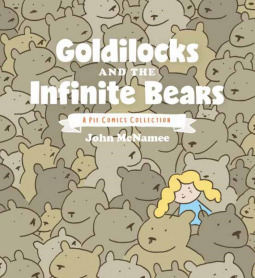 Goldilocks and the Infinite Bears is the first full collection of Pie Comics. Scarf it down all at once during a work break, over a cuppa, or while procrastinating about writing an assignment. If you like this one you might also enjoy Herding Cats by Sara Anderson or Heart and Brain by the Awkward Yeti. Disclaimer: I was given a complimentary copy of this book by Diamond Book Distributors, via Netgalley, in exchange for an honest review.